1 When you think of the Arctic, what comes to your mind? Maybe you think of snow, cold, polar bears, and igloos. Perhaps you think of the people who live there: the Inuit. 2 Some people call the Inuit Eskimos. That is what some other people called them long ago. It was used to describe the Inuit and also other groups of people living in the Arctic region, such as the Yupik and Aleutians. The word Eskimo means "eater of raw meat." Today, many people think the word Eskimo is offensive. 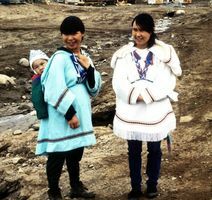 Inuit is a name that simply means "the people." The Inuit have their own language. It is called Inuktitut. 3 The Inuit are descendants of people who came to North America from Asia over an ancient frozen land bridge thousands of years ago. In time these people divided into separate groups. The Inuit were one of these groups. They first came to Canada from Alaska. As they moved east, they found some people already living there, the Tuniit.